Brian Williams' attempt at an anchorman rebound began Tuesday afternoon when he led MSNBC's coverage of Pope Francis' visit to the United States. Williams appeared without any fanfare on the 3 p.m. hour of MSNBC. Seated at a desk in the third floor newsroom of 30 Rockefeller Center, he said hello and quickly handed off to a reporter, Chris Jansing, who was standing by for the pope's arrival in Maryland. Williams did not mention the significance of his first day back on TV. The papal visit will test the viewing public's willingness to forgive Williams and forget about the embarrassing scandal that caused him to fall from network grace earlier this year. 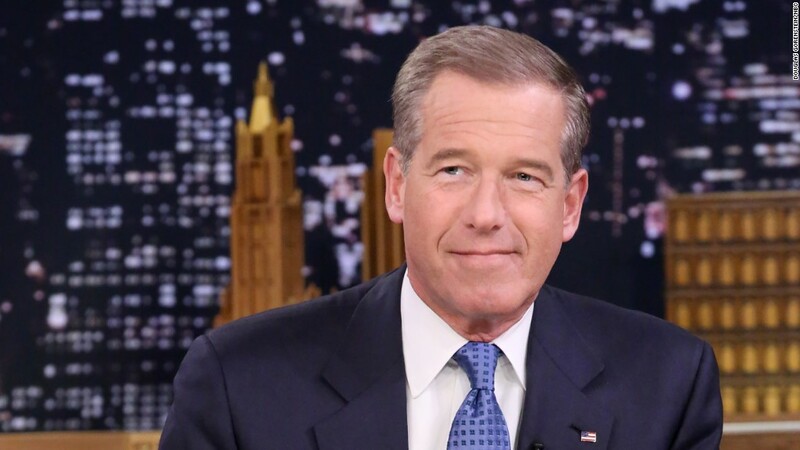 Williams, 56, lost his job as the anchor of the "NBC Nightly News," one of the most prestigious chairs in American television, after revelations that he had exaggerated a series of stories in the past. NBC is bringing him back as a roving anchor for the cable news channel MSNBC amid a broader rebranding of the channel. MSNBC says Williams will be manning its special coverage throughout Pope Francis' six-day visit to Washington, New York and Philadelphia. According to a spokeswoman, he won't be appearing at all on the main NBC network. Papal coverage there will be helmed by his "Nightly News" replacement Lester Holt. MSNBC's corporate point of view is that Williams is one of the biggest stars of television news and that he'll strengthen the cable channel's ratings. In private, the feelings among individual staffers are much more complicated. Some wonder if the impression of Williams as a teller of tall tales will taint the MSNBC brand. Morale remains low at the channel overall. NBC's opaqueness has exacerbated the uncertainty. The network never published any of the detailed findings from its internal investigation into Williams' embellishments. And Williams never granted interviews to any non-NBC news outlets. But Andy Lack, the chairman of NBC News and MSNBC, has spoken with several outlets about Williams' return. "I believe in second chances," Lack told The Washington Post, "and I believe he can earn the trust of colleagues and viewers if we give him that chance. I thought he deserved it." Lack told The New York Times that "Brian will be such an important contribution to MSNBC's page-turn here." That page-turn is a shift from progressive-minded talk to middle-of-the-road news, particularly during the daytime when MSNBC's ratings are the weakest. Williams will take over daytime news coverage when there are big breaking stories -- with the theory that viewers will gravitate toward him. He may even have an advantage by the fact that the audience wants to see him recover from his fall. "America is the home of the second act," NPR media correspondent David Folkenflik said on CNN's "Reliable Sources." "This is not a decision taken on journalistic grounds," he said. "This is a decision taken because Brian Williams is actually an excellent studio performer, and he can present the news very well." Baltimore Sun TV critic David Zurawik, however, cautioned that Williams is likely to remain the subject of social media mockery, challenging any attempt at a career rehabilitation. Zurawik believes Williams should not be returning to the airwaves: "He violated the fundamental sin of this business, which is to tell the truth. He did not tell the truth. He lied on multiple occasions. How do you bring him back?" One of Williams' disputed stories involved a previous papal visit. In 2002, Williams spoke about being a student at Catholic University when Pope John Paul II visited the Washington, D.C. campus in 1979. He didn't mention any interaction with the pope. Two years later, he said he was able to shake the pope's hand during the visit. And one year after that, the story became more colorful. Williams said a Secret Service agent tipped him off about where to stand in order to meet the pope. "He embraced my hand with both of his, made the sign of the cross, and said a blessing to me," Williams said. Another time he told the story, he described the meeting as happenstance without crediting a Secret Service agent. The challenge for Williams now is whether viewers will second guess whether they can believe what he is saying. Or will Williams prove that his failings were minor, not a fatal blow?